During the warmer months of 2004 and 2005 this fungus made frequent appearances in my lawn within a confined area of 3 square metres. I have not seen it elsewhere, or since 2005. 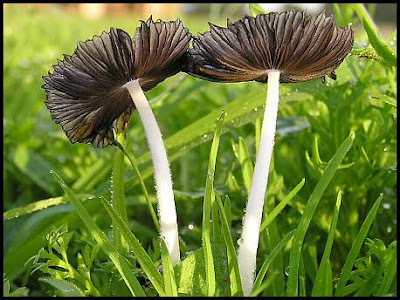 Several species of Coprinus occur in Australia. 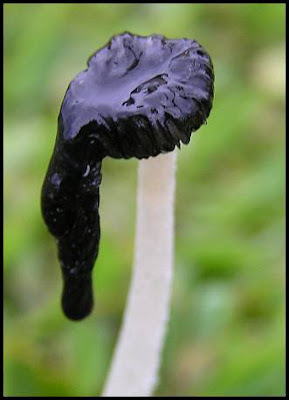 Most coprinus are collectively commonly known as Ink Caps because as the fruitbodies mature they auto-digest from the edge of the cap inwards, dripping a black fluid containing the spores. Most Coprinus are very short lived. 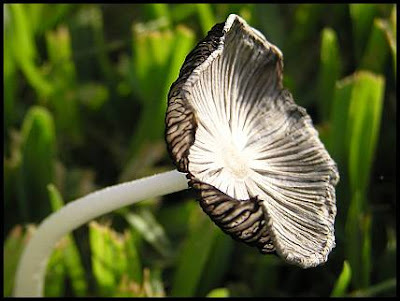 All Coprinus cinereus that I observed, emerged from lawn or soil after dark and had collapsed and virtually disappeared by mid morning the following day, therefore having a lifespan of between 12 and 15 hours. The image above was taken at night. 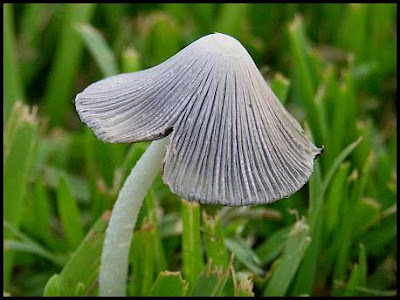 In the image above and the one below, you can see the scattered shaggy remnants of a white veil on the cap. 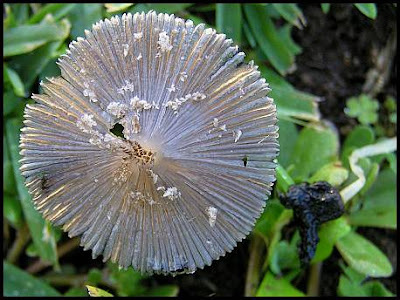 The cap is pale grey, is thin and fragile with white flesh, and is up to 30mm in diameter. The stipe (stem) is white, has soft white scales, is hollow, thin and fragile, and the specimens I have seen have been up to about 90mm tall. The umbrella-shaped cap will split vertically and begin its auto-digestion process by curling up at the edge. 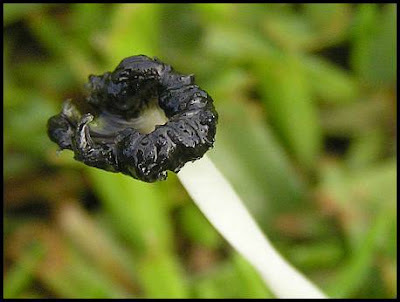 In a very short time, the cap will be reduced to a curled-up black sloppy blob, with the stalk sagging and collapsing. 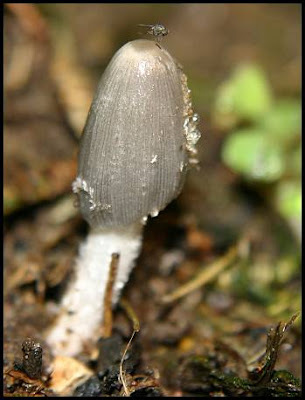 Here is a web site listing Coprinus species from around the world, together with photographs and identification keys. Hunter Valley NSW - in soil or lawn in my backyard - single fungi or small loose groups Jan, Feb, Mar, Apr, May. I'm sorry it's taken me so long to respond to your comment. Thank you, I really get a lot of pleasure from successfully photographing fungi, because it's often quite challenging.